Shortly after taking his first restaurant job in his late teens, Matthew Basford knew that he was headed for a career in the restaurant business. Growing up in Australia, Basford was exposed to cooking techniques that drew influence from Pan-Asian cuisine. He started his culinary journey at Pear Tree Cottage in Greenock, followed by Vintner's Bar and Grill in Angaston. He was awarded Second Place in Tasting Australia in two consecutive competitions and placed in the Nestle Junior Chefs of Australia Competition, a yearly event that honors the top apprentices in the country. After completing his four year apprenticeship, Basford was officially a "Qualified Chef", and travelled to the United States. In December 2002, Basford moved to New Orleans, LA and began working at Dominique's, at the Maison Dupuy Hotel in the French Quarter. When Hurricane Katrina hit New Orleans in 2005, Basford was relocated to Atlanta, GA. Within a week, Basford found himself in the Canoe kitchen. 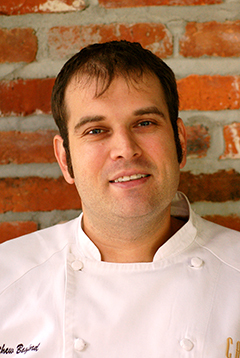 He started as line cook, and worked his way up the ranks from sous chef to executive sous chef, to chef de cuisine, and finally in 2013, Basford was named executive chef of Canoe. He continues the legacy of the city's longstanding bastion of fine dining. His commitment to serving fresh, seasonal ingredients marries well with the rich tradition of Canoe.